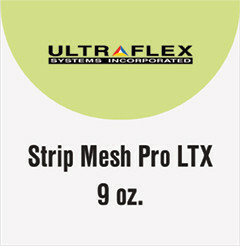 Strip Mesh Pro LTX 9 oz. Strip Mesh Pro LTX is a 9 oz. mesh with backer that may be easily removed after printing. The specially designed backer creates an air-tight print surface which prevents ink spray through the material. The backer allows vacuum equipped printers to hold material flat during printing. Compatible for use with solvent, eco-solvent, UV, Latex and screen printing. Ideal for outdoor banners, building wraps, fence mesh graphics and boulevard banners in high wind areas. Available in widths from 54" - 126”.